I’ve wanted to create a zoned bathroom floor for a while and as I move towards designing the interior for Moregeous Mansions, this style is high on my list of to do’s. 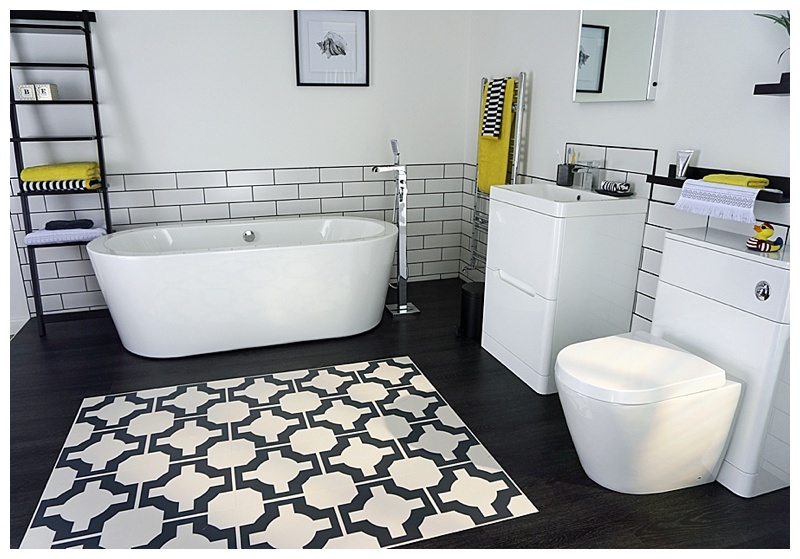 However I was thrilled to get an early chance to play with this funky design idea using these brilliant Harvey Maria vinyl tiles / planks in my monochrome set for the new Bath Empire TV ad. I love that they agreed to such an innovative design and I’m so pleased we could make it happen. There are lots of border tiled floors out there but I wanted something with a big visual impact without being gimmicky, a super cool mat effect in the centre of a classic look. 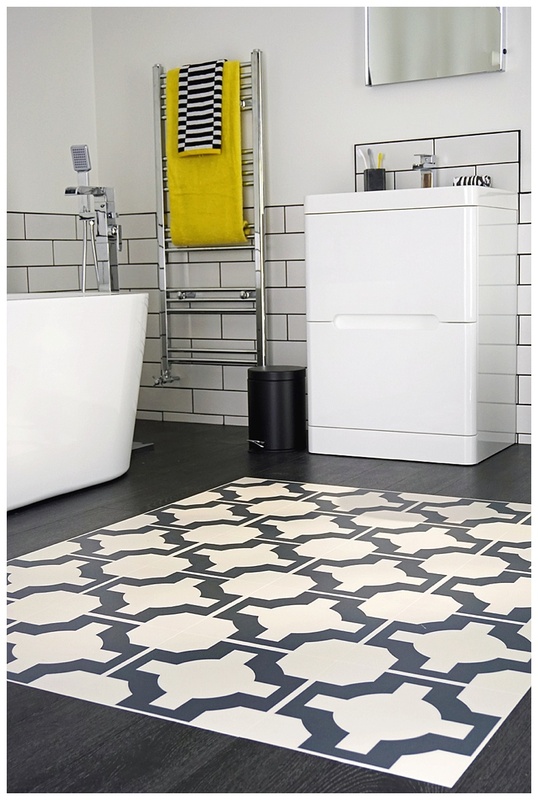 White metro tiles are very on trend but also timeless. They formed the perfect backdrop for a deep charcoal border underneath the suite and around the perimeter of the room. 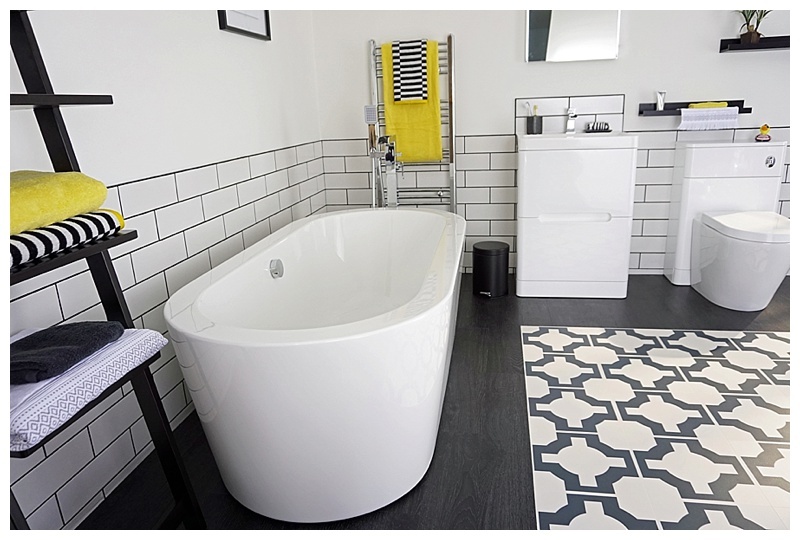 I wanted the freestanding bath to really pop against a dark floor, and then something patterned and fabulous in the middle of the room. Now that we’re staying in our homes rather than treating them like cash pots to be be bought and sold every year, individualism is back and this is a great way to capture personality in interior design – not the whole room, just a part of it. The pattern isn’t overwhelming but serves to highlight a specific area, in this case the centre, but you might decide to pattern mat the area under the bath or the perimeter instead of the centre. It’s up to you! From a practical perspective, it wasn’t difficult. 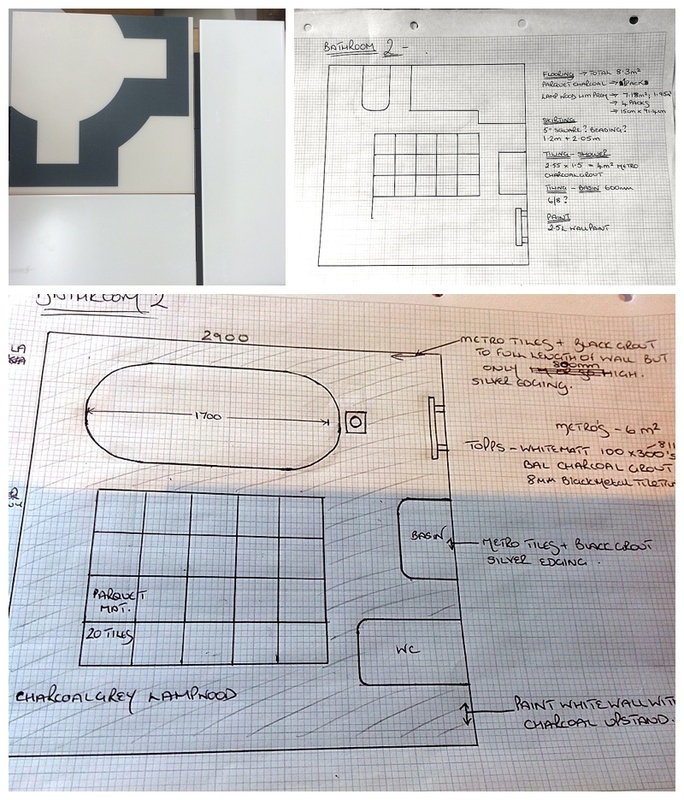 I measured and drew out the room, then worked out exactly how many Parquet tiles and timber effect planks we’d need. Most web-site selling these products have dimensions of each tile / plank online and sell by the m2 approximately. Also when you draw out your room, you’ll see how the zoned areas work with each other and with your bathroom suite. 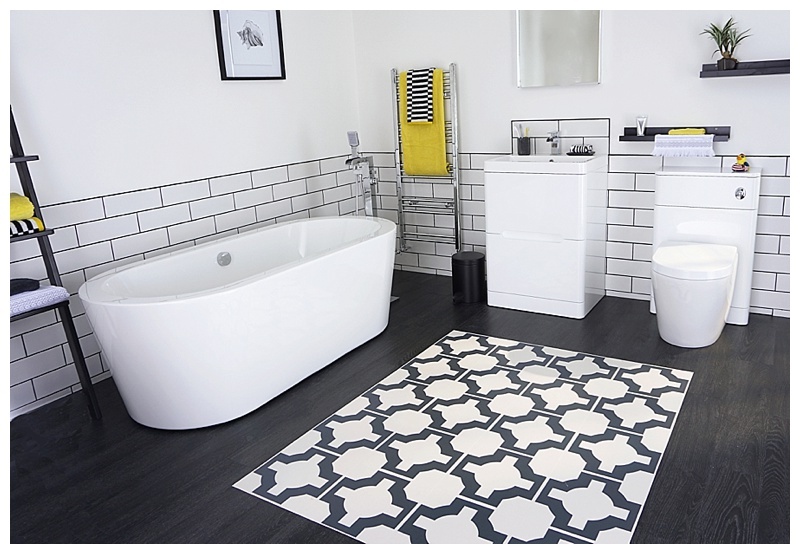 Luxury vinyl tiles are perfect for bathrooms: warm underfoot, easy to clean, not damaged by water and the design detail available now is incredible – they do actually look like wood, but without all the downsides of wood in wet areas. They need to be laid on a flat surface, e.g. plywood with no lumps and bumps but are much thinner than ceramic or stone tiles, so similar levels between hallways into bathrooms for example are easier to achieve. Get a good installer (thank to Alex at Happy Feet in Birmingham for this job and also to Bath Empire’s go-to-guy Jim for working with me so closely during the install!). Here’s a shot of the work mid way through below. What do you think, would you give it a go? I first started playing with floor zoning years ago, and must dig out some images. I remember one grassy kitchen floor merging into dark stained timber and another kitchen covered in apples! The big kitchen diner in the Eastbourne house I designed for Channel 5 was rather gorgeous too, very subtle, check it out HERE. 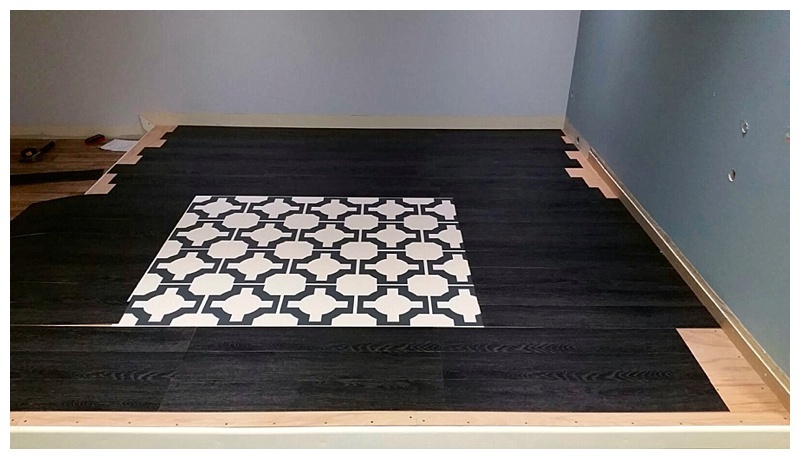 Pingback: How To Zone Floors Successfully – Some More Gorgeous Examples | MOREGEOUS... more than gorgeous! Pingback: How to tile bathrooms or kitchens using Metro or subway tiles | MOREGEOUS... Making Homes More Than Gorgeous!